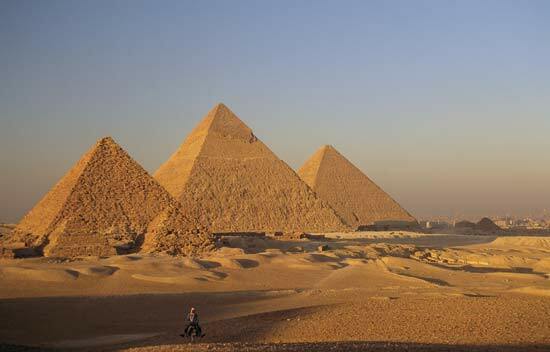 In addition to being a totally awesome sight to behold, the famous pyramids of Giza in Egypt have also been a bit of a mystery. Scientists and archaeologists had a hard time explaining exactly how they were built given the technological limitations of the time period. The Pharaohs had a massive army of laborers at their disposal, but carving those massive blocks out of stone and moving them over miles of scorching desert would seem to be an insurmountable task even for an army of men. I was intrigued when I stumbled across the work of Dr. Joseph Davidovits, who claims that the stones were actually cast from a type of limestone concrete. This method would’ve require FAR less man-power and makes the pyramids’ construction seem much more reasonable. The seemingly impossible construction of the pyramids has fueled some ridiculous crackpot ideas that aliens helped build them. I was very glad to see that real science has actually explained the mystery of their construction quite well. Science wins. As always. Read more about his book Why the Pharaohs built the Pyramids with fake stones on the website of the Geopolymer institute. This morning NASA attempted to launch the Ares I-X, the very first full-scale test version of their new Ares I rocket, which (if NASA proceeds on the current path) will replace the space shuttle as our primary means of transporting astronauts to low earth orbit. But a series of silly issues such as a probe cover getting stuck and a cargo ship accidentally entering the danger zone, combined with bad weather caused the launch to be delayed… possibly until tomorrow, maybe later. 1. Maintain all programs as is, but extend the space shuttle program to 2011 and ISS to 2020. Without extra funding, the Ares rockets wouldn’t be ready until 2020 and there would never be enough money to go to the Moon. 2. Maintain current funding, scrap Ares I, develop an Ares V lite version (about 2/3 of Ares V heavy) and divert extra funds to ISS for extension to 2020. Buy commercial LEO human space flight. The Ares might be ready by 2025, and perhaps get to the Moon after 2030. 3. Add $3 billion per year and proceed with the Constellation program to return to the Moon. The ISS would have to be de-orbited in 2016 to allow a return to the Moon by about 2025. 4. Add $3 billion per year. Extend the ISS to 2020 and get to the Moon by about 2025. Use either Ares V Lite, or Shuttle-C for heavy lift. 5. Add $3 billion per year. Extend the shuttle program to 2011 and extend ISS to 2020. Instead of heading to land on the Moon, orbit the Moon, or go to Near Earth Objects and prepare to go to Mars. Use either Ares V Lite; a heavy Evolved Expendable Launch Vehicles (EELV) or, a shuttle-derivative. Yesterday some news outlets reported on a possible crater in Latvia left by a large meteorite impact. Well, it’s been confirmed as a FAKE, so don’t let anyone tell you otherwise. Some Latvians must’ve had waaay too much time on their hands because after detailed inspection, shovel marks could be seen on the edge of the hole. I won’t spend too much time explaining all the obvious scientific inconsistencies because Dr. Phil Plait has done a thorough job of it at his blog Bad Astronomy. The biggest misconception about meteorites is that all of them cause a crater if they make it all the way to the ground- they don’t. In fact most that do hit the ground are less than a meter in diameter and actually are cold by the time they reach it. They also are traveling at normal terminal velocity and just hit with a non-crater-causing thud. Finally, I’m really happy to see that the Large Hadron Collider repairs came along nicely and they’ve started inserting particles into loop. No actual collisions yet, but if all goes as planned they should be doing their first ones next month. Follow CERN on Twitter for updates.